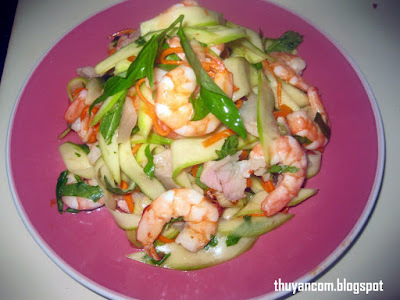 Here I am again experimenting with Goi (Vietnamese Salad). This time I get to play with Xoai Tuong (Green Mango). Xoai tuong is not the typical green mangoes you see at the local supermarket. Xoai tuong is unripen mango that are usually sold on the streets of Vietnam as a snack for those who like the sour taste. It's not golden yellow in color and definitely not sweet. It's actually very hard in texture and when you bite into a slice of these expect to hear a loud crunch. Their color can range from white to pale green and even to a light yellow depending on what stage it is in. I have to say they have an acquired taste because it is quite sour to eat. My mom and dad stay away from these because they think it's "xot ruot" meaning it will sting your intestine due to its sourness. I, on the other hand, love eating these! Every time I see these at the Asian market a I have to buy a couple to satisfy my craving. I usually just eat them as a snack with sugared fish sauce, but I want to change it up a bit and try it as a salad. 2. Cut the mango into smaller pieces. I cut the mango into different portion and discard the pit. I then use a vegetable peeler and shave it into flat pieces. You can probably cut it differently but keep in mind that it has a very hard texture so you want to cut into small pieces so it's easier to work and eat with. 3. Boil the pork belly in salted water until fully cook. Then slice it into 1/2 -1 inche strips. 5. Rough chop 1 cup of vietnamese coriander. 6. Slice the chili into smaller pieces. 1. Add 1/2 cup of sugar to the mango strips and carrots, mix really well. Let it sit for about 10-15 minutes, this way the mango can absorb the sugar so it becomes sweeter. 2. Add fish sauce, 1/2 a lime, fresh chillies, and 1 teaspoon of chili paste. Toss everything together. Add more fish sauce and lime to your liking. 3. Once you are satisfy with the taste add the pork and shrimp, continue to toss. 4. Add Vietnamese coriander right before serving. the mango here (Italy) comes from Brazil and it tastes like potato! you are so much lucky! wow mangoes that taste like potatoes? I'm so sorry to here that you are missing out on the real thing. I really like your blog ! the pictures really help as I like to know if mine look somewhat similar. For this recipe, I assumed I can use those green mangos at the supermarket right ? the really green hard one ? I'm just worry if it's too sour but perhaps if I let it soak with the sugar longer it would get sweeter. Please let me know ! Thanks ! Do you know where these mangos come from? I am looking for the scientific name of these "xoai tuong" for a while but so far unsuccessful. Xoai Tuong refers to unripen green mangoes from Vietnam. You can find green mangoes here in the States at some Asian stores that is similar to Xoai Tuong but it's not the exact same thing. These green mangoes are probably imported from Thailand or maybe Mexico, but it will work for this recipe. I will change the title of the recipe to "Goi Xoai Xanh" because technically I did not use the true Xoai Tuong. I'm sorry for the confusion :( I included a link to different kind of Green Mango from different areas. How many servings can this dish give? Looks delish, but I want to feed 8 people.